Good heavens was it ever cold in Indiana earlier this week! On Wednesday it was -2 for the high. Today it’s going to be 50. As we’ve said for years here in Indiana, if you don’t like the weather, wait five minutes. Meanwhile, read these blog posts I liked from this week. “Dr. Prunesquallor”? What a fantastic pen name! And what a fantastic blog too — thank you so much for sharing it, Jim. Also loved J.P.’s piece (as always) even if I’m not as educated about music as you two are. And what’s not to love about crap cameras that are actually quite good? The title alone makes it worthy of your recommended reading roundup. Thank you, and enjoy the tropical weekend! Prunesquallor’s blog is fascinating – such a view into a world we never get to see. That’s the beauty of blogs! It is always a thrill to make the cut for DTR’s Saturday Roundup. I recall Ronald Reagan telling a story about broadcasting a baseball game early in his career, although his station may have had a ticker tape feed. The feed stopped in the middle of the game and he quickly decided that the only way to stall that would not show up in the box scores of the newspaper the next day was to call a series of (nonexistent) foul balls. He was relieved when the game feed resumed and he was able to catch up. It wasn’t uncommon in those days for stations to recreate games in realtime from wire reports. I’ve read other accounts of it. It was just cool that someone I know from the blogosphere participated in it! Really enjoyed it that you introduced me to Goodman’s version of that song. Never heard of the Cosina CX-2? Did you know that Cosina has made cameras/lenses for pretty much every major camera maker? Cosina is probably the industry’s best kept secret! Thanks for the link to this post though, I’m about to read it! Yes! I know Cosina – just not the CX-2. Oh thank you! I love this shot too. I made it in my bedroom at my old house with my Canon S95. It struggled a little with the low light and so there’s some pixelation in the lower third or so of the photo. You only notice it at larger display sizes, though. I’ll bet I could smooth it out considerably in Photoshop if I tried. 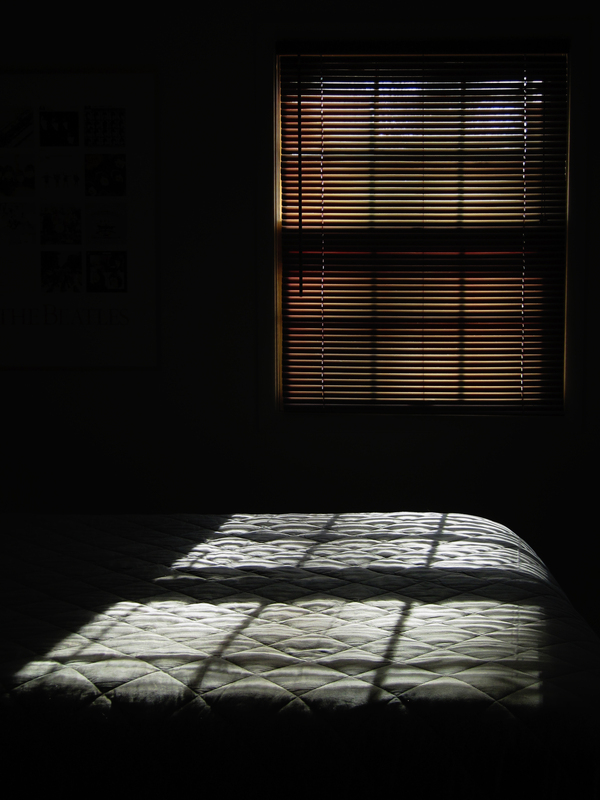 Anyway, the bed is made; the light is spilling onto my quilted bedspread. I suppose knowing that makes the photo a little less evocative.